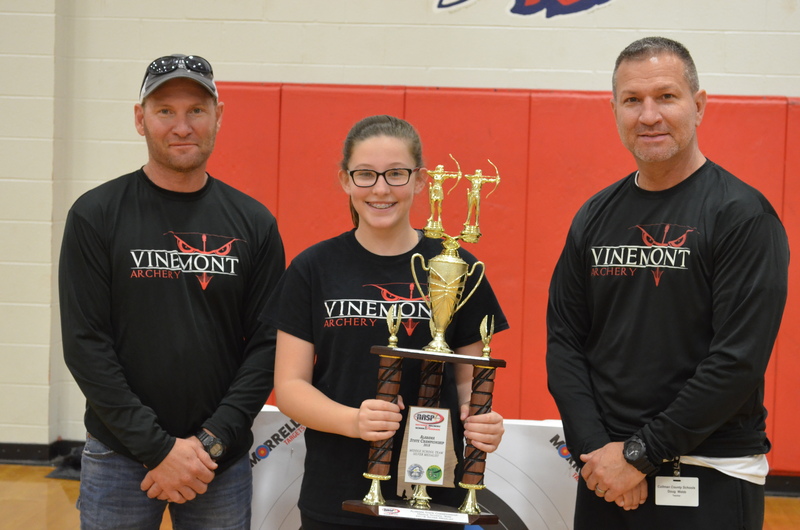 VINEMONT – The 2018 National Archery in the Schools Program (NASP) Alabama State Championship Tournament saw hundreds of young archers from around the state compete and perform well, but perhaps none of them had as special a day as Vinemont Middle School’s Savannah Mann. On top of her team finishing in second place, the seventh-grader finished first out of the 527 girls who competed, defeating Ashville High School 11th-grader Sara Payne in a sudden death shoot-off. Mann scored an impressive 23 tens, 293 total points, and was named the 2018 Alabama Archery in the Schools Middle School Female Gold Medalist. Monday morning, Mann re-lived and gave her perspective of the event from the moment she learned about the shoot-off to the moment she realized what she had just pulled off. Vinemont Middle School Archery Head Coach Doug Webb couldn’t believe what unfolded in front of him that day either. He reminisced about slowly realizing during the competition that it would be a special day for one of his athletes. “I walked by her after round one and asked how it went and she said pretty good, she shot a 50, which is a perfect score, obviously. I didn’t see her shoot the second round and I walked back by and asked how it was going and she said pretty good, another 50. It was kind of like dealing with a pitcher who’s throwing a no-hitter, you know, you just stay away from them. I walked back by again later and she shot a 48 or a 49 and I started doing the math and told (Coach) Davey (Friedrich), ‘Savannah is about to shoot 290-plus.’ When we got done she already knew; it’s not hard to count seven dropped arrows you know,” Webb joked. “Some kids you have a tough time keeping their score, but I walked back by and she said 293 and I thought ‘Oh wow.’ We got done and they came over to me and said they need Savannah Mann, so I said OK and she grinned and said, ‘She needs her bow.’ So, I thought she was in a shoot-off for the middle school title and I went over and got her, and she was getting a little nervous and then I realized this is for the whole thing, the state championship. I didn’t let Savannah know that of course, but it didn’t take long for her to figure out when this 11th grader walks over and shakes her hand. She goes up there and shoots a straight perfect score from 15 meters. We always talk about the yellow ring; just shoot for the yellow ring, don’t worry about the rest of the target, and I walked down there when it was over, and she just looked up at me and grinned and said ‘Coach, I shot yellow ring,” and I said, ‘Yeah, you did,’” smiled Webb. Mann won a brand-new bow to go along with her gold medal and it’s given her an idea for what to do with the old one. Believe it or not, this is Mann’s first year to compete, and at the start of the year she was skeptical that she would be able to get the hang of it. Webb had to persuade her to try out and she was pleasantly surprised by the results. Webb has known Savannah and her family since she was very young, so he had a feeling the sport would be a good fit for her. The said the hardest time he’s had coaching her this year was convincing her to try out for the team. Mann has a lot of years left on the range, but right now she’s focused on the National Tournament in Louisville, Kentucky May 10. Webb has coached a lot of athletes in several different sports; he said Mann’s performance that day in Montgomery stands out among the rest for him. “I’ve coached basketball and baseball and saw kids do a lot of really incredible things over the years, but I’m going to have to say honestly that’s the most impressive display of guts and clutch that I’ve ever seen,” he said proudly.